In this article, I am listing Must have Apps for Android One Phones. These essential apps will enrich Android experience on your Android One Phone which includes Motorola One Power, Xiaomi Mi A2, Infinix Note 5, Nokia 3.1, Nokia 5.1, Nokia 8 Sirocco, Nokia 7 Plus, Nokia 6, Mi A1 and several other smartphones. You might already know that phones under Android One program are manufactured by different companies, however, the operating system (software) part is managed by Google itself. As per the information by Google, these Android One family phones are likely to get faster Android OS updates for two year and regular security updates for three years. As of now following Android phones come under Android One family. If you are not new to Android and already have used some other Android phone which was not running on stock Android, like Samsung, LG or Xiaomi etc. which use their own skins on top of Stock Android. These custom skins by OEMs (Original Equipment Manufacturers – a fancy phrase used for device manufactures) include some additional features and tweaks. And there are chances you may be missing some features of your old Android phone while using your Android One phone. Following apps are the free alternatives to the features that you might be missing on your Android One phone. All the apps listed here are free and some of these are even without ads. For such apps, I have mentioned ‘without ads’ alongside. First app on the list is a File Manager app. Because you need a powerful file manager to utilize your Android One phone in most productive way. 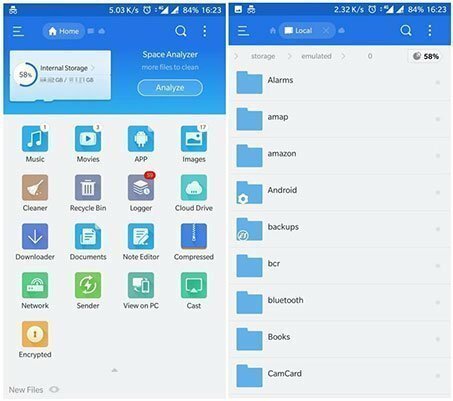 ES File Explorer is a file manager app for your phone’s storage including internal and external expendable memory (using memory card, OTG etc). You can do all the basic file browsing and management of your phone’s storage and expendable memory. In addition to that you can utilize other modern features (of ES File Manager) like accessing storage, files, folders shared over your local area network (LAN), access of cloud drive accounts (like Google Drive, DropBox, OneDrive and Amazon S3 etc.) right from inside the app. On the home screen of the app, you can see storage used and space available, category wise number of files. You can browse these category wise files directly from home screen itself. FREE version is packed with all necessary features and suitable for normal users. Browse files, folders etc. on phone’s internal storage & expandable storage. Can create (add) new file, folder. Can search, share, copy, move files. Files compression and extraction support. Sorting files/folders by name, date, type, size. Integration of cloud accounts like DropBox, Google Drive etc. Supports multi-windows – for multitasking within the app. Second app on this list is a Voice Recorder app. 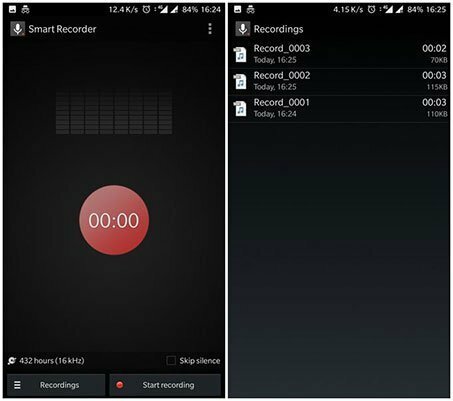 Smart Voice Recorder is in the race because of its tiny size and fairly good voice quality. First thing first, let me make it clear that this app does not record your conversation during phone calls, but it is a voice recording app. Though there are not so many settings in Smart Voice Recorder, what it has got works fine for decent voice recording function. Skip Silence is one of its worth-mentioning features. When you enable Skip Silence option, Smart Voice Recorder will skip the silence (will not record silence) during the recording. This feature could really be useful if you are recording podcasts on your phone. Tiny in size and available for free. Skip silence feature to avoid recording silence. Various sample rate (voice quality) options. Third app on the list is a Media Gallery app. If Google Photos is not your favorite media gallery app, you should give a shot to this one. Piktures – Beautiful Gallery is one of the popular media gallery apps. It comes with several useful features like, album setting – grid settings, setting up password protection, slideshow and much more. It comes with gesture-swipes based user-interface which initially looks little new. But as you start using it you easily become used of it. Piktures offers a feature called ‘Calendar View’ which let you browse photos in calendar dates view. Without ads free full version. Basic image editing included – crop, rotate etc. By media by using Filters like Place, Date, Tags. The .nomedia folder support and list items in hidden section. Theme options for visible customization. Sort media by date, name, size, last modified etc. Exclude folders for media scan. Integration of cloud drive like DropBox, Google Drive, One Drive etc. Forth app is an SMS app. Yes! an SMS app, SMS is still not a thing of past. We still receive verification code/OTP for services/accounts via SMS, right. And sometimes it gets really messy to find the one you need urgently. But not anymore, try this one! 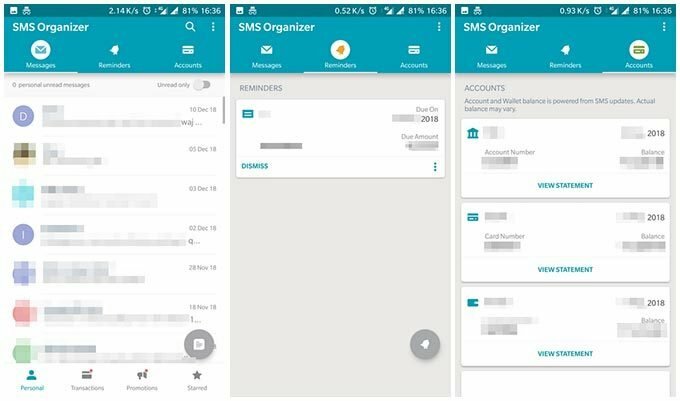 SMS Organizer is an android SMS app offered by Microsoft. This app is like God-mode organizer for viewing and managing SMSs. Though, the app got some really useful features but Automatic SMS categorization is a big time saver. SMSs categorized into four default categories look more organized and easy to access. SMS by Groups is another useful and productivity feature. It organizes SMS in three groups – Messages, Reminders, and Accounts, based on the content of the SMS. For instance, all the banking/wallet transaction messages will be grouped under Accounts. And if there are more than one account, it will organize each account separately. Free full version without any annoying ads. Automatic SMS categorization – Personal, Transactions, Promotions and Starred. Move a message to a certain category like – Transactions, Promotions, and Archive etc. and apply the same for future SMSs. Bulk operations – delete, move, mark as unread/read. Fifth app on this list is a Wi-Fi File Transfer app. Although you can share files between phone and computer using Bluetooth. But it is very time-consuming when files are large in size. 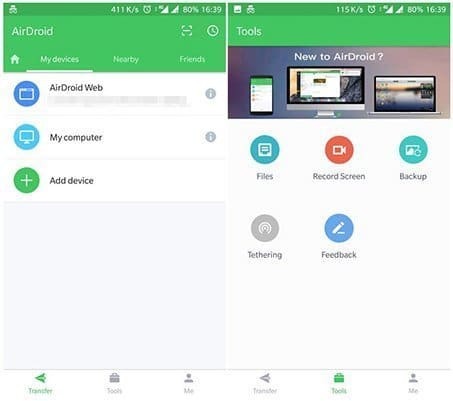 AirDroid is a useful app to wirelessly connect your phone to PC (Windows, Mac, Linux etc.) using Wi-Fi. Once you connect your phone to PC over Wi-Fi, you can transfer files/data from your phone to PC and vice versa using this app. In addition to that, AirDroid allows accessing most of the features and files of your phone from the computer over Wi-Fi. For instance, you can dial & receive phone calls, send & read messages from your computer’s screen. And even more, you can cast your device screen, videos and pictures on your computer screen for free of charge. Wi-Fi File transfer from phone to PC and PC to phone. 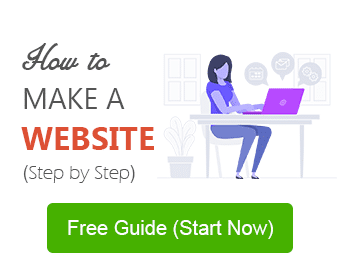 Supports file transfer via web. Data and Apps accessibility from the computer. App management from the computer. Phone/Device info – battery charge remaining, model etc. on PC. Cast phone screen on PC. Sixth app on the list is a Dictionary app. 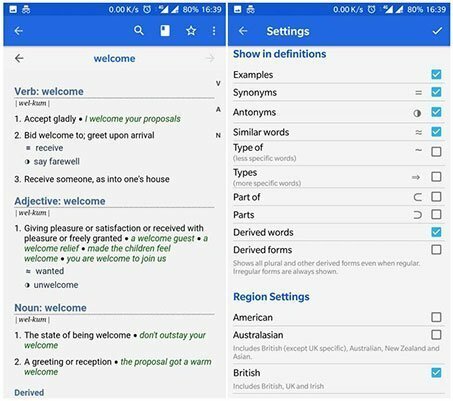 This app could save your time if you use the dictionary on your phone. Check out the features of this dictionary app, you will love it. WordWeb is a free offline dictionary and thesaurus app with text pronunciations. Approximately one-tenth of three million words, phrases and derivatives are covered by WordWeb. Also, WordWeb dictionary includes thesaurus alongwith related words & synonyms. The dictionary seach includes intelligent & accurate words suggestion as you start typing, alphabeticcal listing, words sound-similar & often-confused. The best part is that it’s absolutely offline i.e. once you install on your phone and set it up, no internet connection is required to use the dictionary. Free full version without ads. Intelligent and accurate word suggestion. Word meaning with definitions, usages examples. Filter noun, verb adverb and adjective in search results. Seventh app on this list is a Video player app. Stock in-app video players are boring and come with few features only. Yes, your favorite video player from your computer is available for android phone as well. VLC needs no introduction but it would be injustice to not outline features of this amazing video player app (Probably PC version of VLC we all have used on our Windows, Mac or Linux computer). 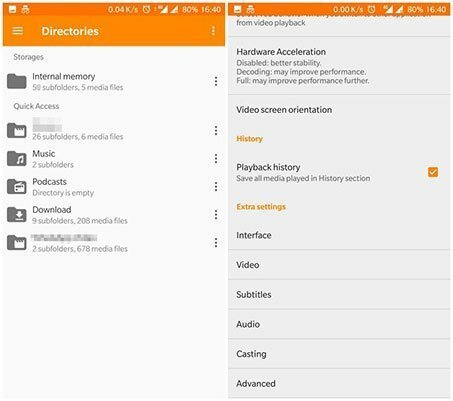 VLC for Android comes with a lot of useful features – Multi track audio, Aspect Ratio adjustments, control-lock and much more. Above all of this, it supports all popular formats including MKV, MP4, MOV, AAC and AVI etc. without any additional codec/add-on. The app not only play the videos on your phone, but the audio files like MP3, OOG, etc. can also be played. You can choose any folder on your device which need to be synced with this app and it will display the thumbnails of all the available videos and audios on your device. Playback speed, Jump to time. Eight app on the list is an App Locker. These days our phones have really important and sensitive information, therefore, it’s a good idea to add an additional security layer to your apps. 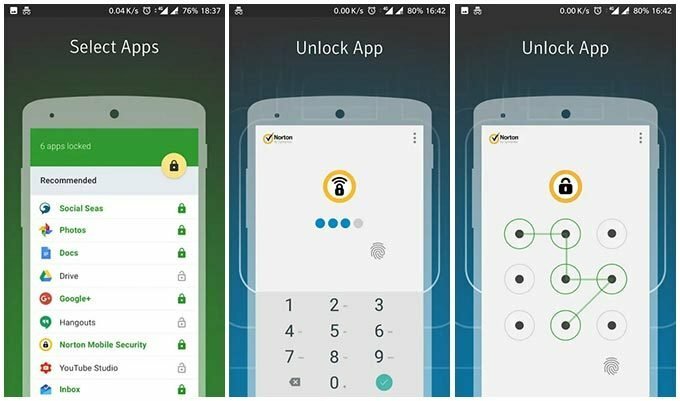 With Norton App Lock, you can lock any app installed on your phone to protect your privacy. Norton App Lock helps you to protect your personal and sensitive information (banking & other financial apps etc.) by enabling a secure password or pattern lock. In addition to that, an App Locker helps to avoid ‘pocket-dial’ accidents. Norton App Lock’s break-in alert feature captures a photo the person who fails to unlock the app after 3 attempts. And photos are saved in photos folder. Small in size & simple user-interface. 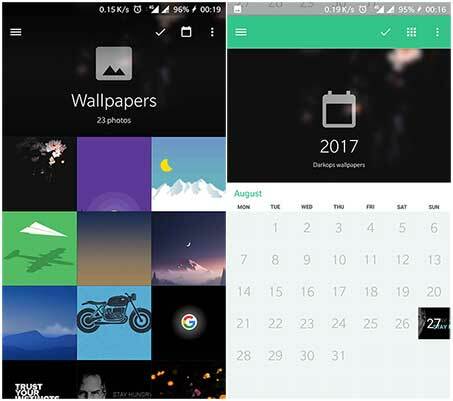 You should give these Must have Apps for Android One Phones (Android Devices running on Stock Android) a try, you will not regret. These apps will definitely help you to use your phone more efficiently, and you can thank me later ;). What other features do you wish to have on your Android One Phone? Let us know via comment section below. Also share, according to you what other apps deserve to be on this list? We’ll try to list suggested apps in next update. How do I get the voice recorder app? It is not on my phone. Thanks for asking this. You can use the link given in this post to download Smart Voice Recorder from play store. Or you can search “Smart Voice Recorder” in Google Play Store and download it from there. Hope this ‘ll help you out. Thank you dear. Its help me a lot. I m new on android & have Nexus 5. Is there any option of offline profile. I am glad that I could help. Looking forward to listen more from you, what kind of offline profile you are looking for?